Tubing installed above the subfloor and between sleepers is easy to avoid with nails. Installing the tubing below the floor requires shorter fasteners or great care, but adds nothing to the floor height. Installation shouldn’t begin until reaching the target moisture content. The ideal is to install the flooring at the average moisture content for the location over subflooring that’s at the same moisture content or lower. Acclimating wood flooring to too low a moisture content is a common mistake. When seasonal humidity rises, so will the moisture content of the wood flooring. In much of the country, the seasonal humidity is at its highest in the summer when the radiant heating system isn’t operating. 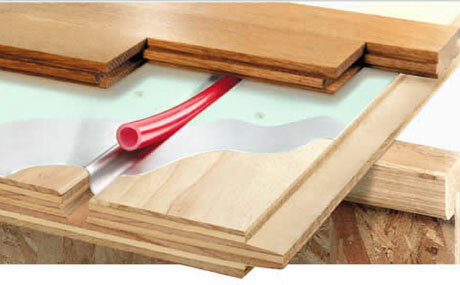 In these conditions, flooring picks up moisture and swells. The result will be at least cupping and maybe buckling from the stress of expansion.